In 2005, the population of Alaska was 663,661, which is an increase of 5,906, or 0.9%, from the prior year and an increase of 36,730, or 5.9%, since the year 2000 . This includes a natural increase since the last census of 36,590 people (53,132 births minus 16,542 deaths) and an increase due to net migration of 1,181 people into the state. Immigration from outside the United States resulted in a net increase of 5,800 people, and migration within the country produced a net loss of 4,619 people. More than half of the state's population lives in Anchorage, Juneau and Fairbanks, with two-fifths in Anchorage alone. With a population of 710,231, according to the 2010 U.S. census,  Alaska is the 48th most populous and least densely populated state. For purposes of the federal census, the state is divided into artificial divisions defined geographically by the United States Census Bureau for statistical purposes only. The population was 5.5% of Hispanic or Latino origin (of any race) and 94.5% of Non-Hispanic and Latino origin (of any race). The vast and sparsely populated regions of northern and western Alaska are primarily inhabited by Alaska Natives, who are also numerous in the southeast. Anchorage, Fairbanks, and other parts of south-central and southeast Alaska have many White Americans of northern and western European ancestry. The Wrangell- Petersburg area has many residents of Scandinavian ancestry and the Aleutian Islands contain a large Filipino population. The vast majority of the state's African American population lives in Anchorage and Fairbanks. Also, Alaska has the largest percentage of American Indians of any state. Some of the Alaska Natives absorbed the small 1700s Russian-era settlement. According to the 2005-2007 American Community Survey, 84.7% of people over the age of five speak only English at home. About 3.5% speak Spanish at home. About 2.2% speak an Indo-European language other than Spanish or English at home and about 4.3% speak an Asian language at home. And about 5.3% speak other languages at home. A total of 5.2% of Alaskans speak one of the state's 22 indigenous languages, known locally as "native languages". These languages belong to two major language families: Eskimo–Aleut and Na-Dené. As the homeland of these two major language families of North America, Alaska has been described as the crossroads of the continent, providing evidence for the recent settlement of North America via the Bering land bridge. Russian Orthodox church in Sitka, Alaska. Alaska's relatively large Orthodox Christian population is notable. 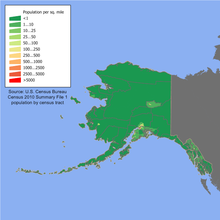 The large Eastern Orthodox population (with 49 parishes and up to 50,000 followers) is a result of early Russian colonization of the Americas which centered on Alaska, and the missionary work among Alaska Natives. 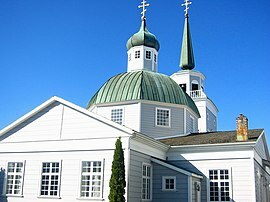 In 1795, the first Russian Orthodox Church was established in Kodiak. Intermarriage with Alaskan Natives helped the Russian immigrants integrate into society. As a result, a number of Russian Orthodox churches gradually became established within Alaska. Many are members of the Orthodox Church in America while others are members of the Russian Orthodox Church Outside Russia. Alaska also has the largest Quaker population (by percentage) of any state. ^ "Graphical Library of Demographic Change in Arctic Alaska". Retrieved 7 July 2018. ^ U.S. Census Bureau. (2001-04-02). "Census 2000 PHC-T-2. Ranking Tables for States: 1990 and 2000. Table 1. States Ranked by Population: 2000." U.S. Census Bureau, Population Division. Retrieved on 2007-06-12. ^ Population and Population Centers by State: 2010. United States Census Bureau. Retrieved February 5, 2017. ^ CDC's STATE System - State Comparison Report Cigarette Use (Adults) – BRFSS[ permanent dead link] for 2006, lists Alaska as having 24.2% smokers. The national average is 20.8% according to Cigarette Smoking Among Adults-United States, 2006 article in the CDC's Morbidity and Mortality Weekly Report. ^ Bureau, U.S. Census. "American FactFinder - Results". factfinder2.census.gov. Retrieved 17 April 2018. ^ "National Vital Statistics Reports, Volume 64, Number 1" (PDF). cdc.gov. Retrieved 17 April 2018. ^ "National Vital Statistics Reports, Volume 64, Number 12" (PDF). cdc.gov. Retrieved 17 April 2018. ^ "National Vital Statistics Reports, Volume 66, Number 1" (PDF). cdc.gov. Retrieved 17 April 2018. ^ Coast Tsimshian is not technically indigenous to Alaska, the Coast Tsimshian people having moved north from British Columbia in the historic period. Nevertheless it is usually grouped with the other Native languages. ^ "Survey Finds Alaskans Less Religious Than Other Americans". pewforum.org. 4 September 2008. Retrieved 17 April 2018. ^ "j. - Alaskan Jews trying to connect, says study". jewishsf.com. Retrieved 17 April 2018.